A young boy named Nemo is visited each night by monsters who want to take him away. Wow, Little Nemo sure got dark in a hurry. Aside, those are gorgeous carvings on that bed. 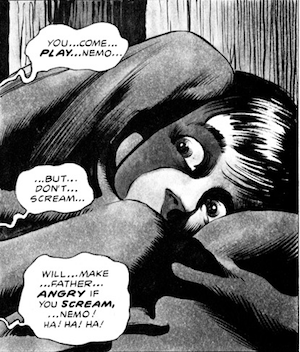 For another childhood-ruiner of a take on Little Nemo, one can check out the one-shot digital comic Big Nemo, by Alan "you can't actually be surprised it's me" Moore and Colleen Doran. Funny...these seem very close to Leeds vecraft's Ghouls, especially with the speech patterns resembling those of the Ghouls seen in "Providence". I wonder if Alan Moore was a fan of this story...? *"Lovecraft's Ghouls". drat it all. Sorry, but comics.org lists this as only an 8 page story, and the 1/3 rule applies in such cases, so you will have to trim it in line with board rules. "Why'd did you put your bed out the window, young man?" The kid nearly died and called for your help! WHY DO YOU THINK HE DID THIS, LET ALONE ABUSIVE PUNISHMENT!?!?! I know parents don't believe in the supernatural in these stories... but they believe the most RIDICULOUS in its stead? 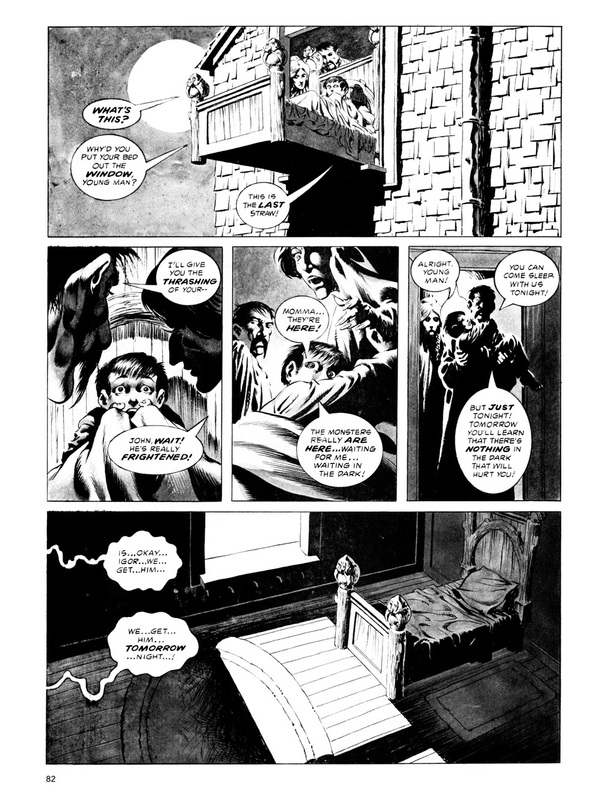 "Yeah the kid talks about creepy demons trying to kill him, but it is really him doing this crazy stuff like moving his solid wooden bed near the edge out the window while screaming for help in said bed. Don't worry, if he acts up again, I'll give him a beating till he learns." That's AWFUL parenting no matter what genre of horror you're writing. The monsters are just creepy in comparison to that. And while we're at it... what an AWFUL design for the house. Who puts window ledges THAT low to the ground on the 2nd ground? I think the demons are actually trying to teach Nemo to have fun. I mean, they pretty much might be angels who only look like demons because how his parents make any deviation of their own values be bad to Nemo.